philosophical theory about the nature of organic systems, holding that organisms are machines in the sense that they are material systems. Mechanism seeks to explain biological processes, including behavior, within the framework of classical physics and chemistry. The mechanistic approach has caused great controversy and is considered by its opponents, including vitalists (who contend that living organisms must be explained in terms of a mysterious self-determining principle rather than in physical or chemical terms) as inadequate and oversimplified. See A. R. Anderson, Minds and Machines (1964); R. E. Schofield, Mechanism and Materialism (1969). a one-sided method of knowledge and a world outlook based on the idea that the mechanical form of motion is the only objective form. The consistent development of this view leads to a rejection of the qualitative diversity of phenomena in nature and society, or to the view that this diversity is merely a subjective illusion. In its broader sense, mechanism is a method of reducing complex phenomena to their simpler components—a method of breaking down the whole into parts that are nonspecific to the given whole (for example, into biological relations, when dealing with social phenomena, and into physicochemical relations, when dealing with biology). Historically, mechanism was the prevailing trend in scientific materialist thought from the 16th century to the 18th, when mechanics was the only developed science to find application in industry, and therefore seemed to be “science in general,” an absolute science that possessed a corresponding absolute method —mathematics, conceived primarily mechanistically. Galileo, I. Newton, and P. S. Laplace (natural science) and T. Hobbes, J. La Mettrie, and P. Holbach (philosophy) may be considered classic representatives of mechanism. Typical representatives in the 19th century were L. Biichner, K. Vogt, J. Moleschott, and E. Diihring. The one-sided mechanistic approach to the knowledge of natural and social phenomena was criticized by B. Spinoza, G. W. Leibniz, and, in part, by D. Diderot. As a conditionally justified method of thinking, it was overcome (“canceled,” aufgehoben) by G. Hegel (who was responsible for the very term “mechanism”) in the dialectical understanding of the problems and nature of thought. While criticizing mechanism, Hegel simultaneously identified its shortcomings with the nature of materialism in general. Hegel “wanted to throw contempt on materialism by the addition ’mechanical.’ Now the materialism criticized by Hegel—the French materialism of the 18th century—was in fact exclusively mechanical” (F. Engels, see K. Marx and F. Engels, Soch., 2nd ed., vol. 20, pp. 568–69). Mechanism is a historical, obsolete stage in the development of materialist philosophy and any attempt to resurrect it under present conditions must be construed as a scientific regression. The possibility of relapses into mechanism exists, since any form of material motion, no matter how complex and developed, contains mechanical motion as one of its aspects. Therefore, not only different but also directly contrary processes and phenomena can be made to agree with the laws of mechanics; it is precisely during such an “agreement” that there takes place the leveling, during which the qualitative uniqueness and contradictoriness of these contrary processes and phenomena are forgotten. With regard to any form of motion other than the purely mechanical, mechanism ultimately leads to the recognition of the fundamental impossibility of gaining knowledge of it. For Galileo, Hobbes, and the French materialists, mechanism did not lead in the slightest degree to agnosticism. But in the 19th century, agnostic views became popular among mechanist natural scientists. According to the principle that without mechanics there can be no science, any knowledge that reveals the nature of supramechanical aspects of motion is declared unscientific. Mechanism advances the concept of special external forces, in which the real aspects, abstracted from motion, are transformed into independently existing mechanical causes of this motion. “In mechanics the causes of motion are taken as given and their origin is disregarded, only their effects being taken into account. Hence, if a cause of motion is termed a force, this does not damage mechanics as such; but it becomes a custom to transfer this term also to physics, chemistry, and biology, and then confusion is inevitable” (ibid., p. 407). The groundlessness of mechanism is manifested with particular clarity in the problems of thought, consciousness, and life. Here mechanism serves as the basis for vitalism, teleology, and idealism. As a philosophical theory, mechanism is a typical example of metaphysical thinking, which is incapable of coping with contradiction. On encountering opposite definitions of an object, mechanism always attempts to remove one of them (for example, quality in favor of quantity), or assumes that only one of them is true, in contrast to the other, which is assumed to be untrue; mechanism may uphold absolute randomness at one time, then absolute necessity at another; at one time discreteness, at another, continuity, and so forth. Mechanism mystifies the very concept of active cause and interprets motion not as the spontaneous motion of matter but as a result of an external force. Therefore, in this view, matter seems to be an inert and stagnant mass. Dialectical materialism established, based on a generalization of scientific data, that mechanical motion is an aspect and an abstract, universal condition of any motion. In higher, supra-mechanical processes it is an accompanying form that is necessary, but far from sufficient, to characterize the nature of these processes. Engels, F. “Dialektika prirody.” In K. Marx and F. Engels, Soch., 2nd ed., vol. 20. Hegel, G. W. F. Entsiklopediiafilosofskikh nauk, part 1: “Logika.” Soch., vol. 1. Moscow-Leningrad, 1929. Hegel, G. W. F. “Nauka logiki.” Ibid., vols. 5–6. Moscow, 1937–39. Samuskevich, A. V. “Nekotorye filosofskie voprosy atomistiki i bor’ba protiv mekhanitsizma v sovremennoi fizike.” In Nauchnye trudy po filosofii [Belarus, un-ta], issue 1. Minsk, 1956. Vislobokov, A. D. Marksistskaia dialektika i sovremennyi mekhanitsizm. Moscow, 1962.
a system of bodies intended to transform the motion of one or several bodies into the required motions of other bodies. Mechanisms are the basis of most machines and are used in many instruments, apparatus, and technical devices. A rigid body that is part of a mechanism is called an element and may consist of one or several rigidly connected parts (the parts are manufactured separately). A combination of two contiguous elements that allows relative motion between the elements is called a kinematic pair. The most widely used kinematic pairs are the rotating pair (rotary joint), sliding pair (the sliding block and guide), screw pair (the screw and nut), and spherical pair (the ball-and-socket joint). If, in addition to rigid bodies (the elements), liquid bodies or gaseous bodies participate in the transformation of motion, then the mechanism is said to be hydraulic or pneumatic, respectively. 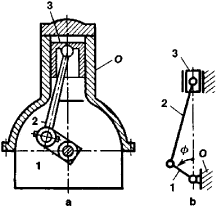 line segments that connect the centers of the joints, the crosshead is in the form of a rectangle, and the support O is in the form of the hatched segment that represents the crosshead guide and a triangle with a joint that has a fixed axis of rotation. In order to determine the position of all movable elements of the mechanism from a functional diagram, one need only know the position of one element. An element whose position is determined for any given instant of time is called an initial element. In the study of a mechanism, the number of initial elements must coincide with the number of degrees of freedom of the mechanism, that is, with the number of independent variables that determine the position of all the elements. The mechanism of an internal-combustion engine has one degree of freedom; the angle ϕ may be used as the independent variable for the mechanism. In a linkwork with two degrees of freedom (Figure 2), the angles (ϕ1 and ϕ2, or ϕ1 and ϕ3, or finally ϕ2 and ϕ3 may be the independent variables. A mechanism is used when the required motion of bodies cannot be produced directly and the motion must be transformed. For example, the rotor of an electric motor and the bearings in which it rotates do not form a mechanism, since in this case the electrical energy is transformed directly into the required motion without any intermediate transformation of mechanical motion. A mechanism is introduced only when the angular velocity of the drive shaft must be reduced, that is, when a reduction gear is included. The mechanism of an internal-combustion engine transforms the rectilinear motion of the piston into the rotary motion of the crankshaft. A mechanism designed to transmit rotary or rectilinear motion is called a transmission mechanism or a transmission. Depending on the type of the elements employed, a distinction is made among gear drives, leverages, friction drives, chain drives, and belt drives. Other examples of this type of mechanism include hydraulic and pneumatic transmissions. A mechanism used to reproduce the motion of some point along a prescribed trajectory is called a guide mechanism. Mechanisms that reproduce motion in a straight line (rectilinear guide mechanisms) and along the arc of a circle (circular guide mechanisms) are the most widely used guide mechanisms. Mechanisms designed for the complex movement of a rigid body in space or in a plane are called transport mechanisms. In the 1960’s and the early 1970’s, new mechanisms were developed to perform tasks associated with space technology (mechanisms for transmitting rotation in a vacuum, spatial-orientation mechanisms) and medical engineering (artificial organs, prostheses) and to operate in environments that are inaccessible or dangerous to man (underwater, in outer space, inside atomic reactors). Manipulators, which are based on spatial mechanisms with many degrees of freedom, have been used to perform such types of work. The development of manipulators has led to the creation of industrial robots that make it possible to automate the processes of the working, installation, and assembly of manufactured articles. Kozhevnikov, S. N., la. I. Esipenko, and la. M. Raskin. Mekhanizmy, 3rd ed. Moscow, 1965. Artobolevskii, 1.1. Mekhanizmy v sovremennoi tekhnike, vols. 1–2. Moscow, 1970–71. A detailed description of the course of a chemical reaction as it proceeds from the reactants to the products, with as complete a characterization as possible of the reaction steps and intermediate species. Also known as reaction path. That part of a machine which contains two or more pieces so arranged that the motion of one compels the motion of the others. Degree of freedom is conveniently illustrated for mechanisms with rigid links. The discussion is limited to mechanisms which obey the general degree-of-freedom equation, where F = degree of freedom of mechanism, l = number of links of mechanism, j = number of joints of mechanism, fi = degree of freedom of relative motion at ith joint, σ = summation symbol (summation over all joints), and λ = mobility number (the most common cases are λ = 3 for plane mechanisms and λ = 6 for spatial mechanisms). The kinematic structure of a mechanism refers to the identification of the joint connection between its links. Just as chemical compounds can be represented by an abstract formula and electric circuits by schematic diagrams, the kinematic structure of mechanisms can be usefully represented by abstract diagrams. The structure of mechanisms for which each joint connects two links can be represented by a structural diagram, or graph, in which links are denoted by vertices, joints by edges, and in which the edge connection of vertices corresponds to the joint connection of links; edges are labeled according to joint type, and the fixed link is identified as well. Thus the graph of the slider-crank mechanism of illustration a is as shown in illustration b. In this figure the circle around vertex 1 signifies that link 1 is fixed. Kinematics is divided into kinematic analysis (analysis of a mechanism of given dimensions) and synthesis (determination of the proportions of a mechanism for given motion requirements). It includes the investigation of finite as well as infinitesimal displacements, velocities, accelerations and higher accelerations, and curvatures and higher curvatures in plane and three-dimensional motions. The design of mechanisms involves many factors. These include their structure, kinematics, dynamics, stress analysis, materials, lubrication, wear, tolerances, production considerations, control and actuation, vibrations, critical speeds, reliability, costs, and environmental considerations. Modern trends in the design of mechanisms emphasize economical design analysis by means of computer-aided design techniques. This mechanism will be available for the payment of goods and services traded between Pakistan and Iran. Execution of transactions under this mechanism will be subject to compliance of all applicable foreign exchange rules and regulations. Let us consider the complex plane joint-lever mechanism of fourth class (Fig. Summary: A new study by a Pennsylvania State University professor finds that the most effective corporate governance occurs when multiple mechanisms are in place. Remains the debatable notion of the centre: who he "mechanical engineer"--a master of the mechanism, or too mechanism, but higher-level. Innovation in the scientific investigations of the term "economic mechanism"
The 2011 Mechanisms and Robotics Conference is currently being organized by Mike Stanisic (Conference Chair) and Jim Schmiedeler (Program Chair). For any object that's needs moving from one position to another a mechanism of some sort is required. The draft covenant in the Windsor Report also includes what amounts to a dispute-settling mechanism (what Mr. The 12 middle chapters provide an in-depth review of the known resistance mechanisms found in most of the pathogenic bacteria and bacteria of public health importance in animals. This mechanism has the potential to accelerate investment in developing countries sustainably, by encouraging Annex I countries to invest funds in or provide technology transfers for projects that reduce greenhouse gas emissions in Non-Annex I countries. Most epigenetic modification, by whatever mechanism, is believed to be erased with each new generation, during gameto-genesis and after fertilization.